For other uses, see Gers (disambiguation). Gers (Gascon: Gers) is a department in the Occitanie region in the southwest of France named after the Gers river. Gers is one of the 83 French departments made during the French revolution, on 4 March 1790. It was created from parts of the old provinces of Guyenne and Gascony. The new department had six districts: Auch, Lectoure, Condom, Nogaro, L'Isle-Jourdain and Mirande. The capital (now prefecture) was Auch. in 1808, part of the Gers department was transferred to the new Tarn-et-Garonne department'. Summer in Gers. In the background, the Pyrenees. Gers is known for its hilly landscape and bastide villages. The Pyrenees are visible to the south. Gers is part of the Occitanie region, and is the 34th French department in area with 6,256.8 km2 (2,416 sq mi). The main rivers of the department are the Garonne and the Gers, a left tributary of the Garonne. Other rivers are Save, Gimone, Arrats, Baïse and Osse. The highest point in the department is Mont de Chapelle Saint Roch (43°21′20″N 00°30′09″E﻿ / ﻿43.35556°N 0.50250°E﻿ / 43.35556; 0.50250﻿ (Mont de Chapelle Saint Roch)), in west central Pyrénées near the border with the Hautes-Pyrénées department, with an altitude of 377 m (1,237 ft). The climate of Gers is an oceanic climate with template summers, Cfb (Marine West Coast Climate) in the Köppen climate classification. The annual rainfall in the department varies from over 900 mm (35.4 in) in the southwest of the department, to less than 700 mm (27.6 in) in the northeast (Auch, Condom and Lectoure). Summers are very hot and dry, the temperatures often exceed 40 °C (104 °F). Winters vary, often with frost, but the climate remains mild and dry. The department is managed by the Departamental Council of the Gers in Auch. Gers is part of the region of Occitanie. There are 3 arrondissements (districts), 17 cantons and 462 communes (municipalities) in Gers. The inhabitants of Gers are known, in French, as Gersois (women: Gersoises). Gers has a population, in 2014, of 190,625, for a population density of 30.5 inhabitants/km2. The arrondissement of Auch, with 87,118 inhabitants, is by far the largest. The other two, Condom and Mirande, have respectively 65,562 and 37,945 inhabitants. The economy in Gers revolves primarily around agriculture and culinary tourism. The department is a producer of maize, wheat, rapeseed, sunflower. ↑ "Les Conseillers Départamentaux" (in French). Conseil départemental du Gers. Retrieved 6 March 2017. ↑ 2.0 2.1 "Département du Gers (32) - Résumé statistique". Comparateur de territoire (in French). Institut national de la statistique et des études économiques - INSEE. Retrieved 6 March 2017. ↑ 3.0 3.1 "Populations légales 2014 des départements et des collectivités d'outre-mer" (in French). Institut national de la statistique et des études économiques - INSEE. Retrieved 6 March 2017. ↑ 4.0 4.1 "Historique du Gers". Le SPLAF (in French). Retrieved 1 April 2014. ↑ "Mont de Chapelle Saint Roch, France". Peakbagger.com. Retrieved 22 September 2016. ↑ "Auch, France - Köppen Climate Classification". Weatherbase. Retrieved 4 April 2014. ↑ "Département du Gers (32)" (in French). Institut national de la statistique et des études économiques - INSEE. Retrieved 6 March 2017. ↑ 8.0 8.1 8.2 "Régions, départements, arrondissements, cantons et communes" (PDF). Populations légales 2014 (in French). Institut national de la statistique et des études économiques - INSEE. Retrieved 6 March 2017. ↑ "Département du Gers (32)". Comparateur de territoire (in French). Institut national de la statistique et des études économiques - INSEE. Retrieved 6 March 2017. ↑ "Gers (32)" (in French). habitants.fr. Retrieved 2 April 2014. 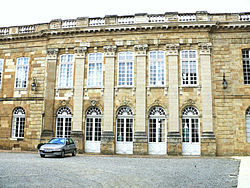 Wikimedia Commons has media related to Gers (department). This page was last changed on 12 September 2018, at 03:50.